Self-Service Analytics allows end users to easily analyze their data by building their own reports and modify existing ones with little to no training. 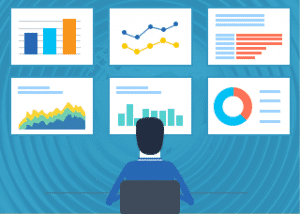 Self-Service Analytics or ad hoc reporting gives users the ability to develop rapid reports, empowering users to analyze their data. End users can analyze their data by dynamically modifying, drilling through, or adding calculation functions to a report. This flexibility decreases IT resource drain freeing up valuable development resources. 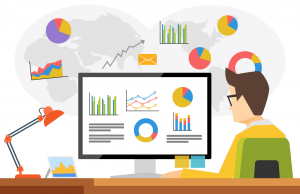 With JReport’s self-service BI capability, end users can quickly get started by building their own reports. They can choose a data source and perform a one-click convert to any type of chart or widget. End users then choose a layout to populate the report with data. Developers create the foundation for self-service, so end users don’t need to understand the underlying structure of the database schema they’re using. Developers define a metadata layer which helps guide end users to the correct data. With the end user in mind, JReport makes self-service analytics simple with a complete user-friendly experience. 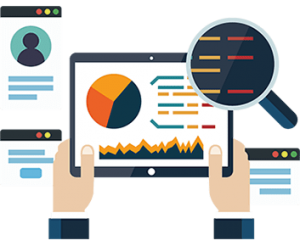 JReport also allows users to customize and interact with their reports to perform deeper data analysis for better business insights. End users can sort, filter, and drill into data via on-screen controls or by changing their data view. Furthermore, users can drag and drop different components such as tables, crosstabs, charts, parameters, filter controls, labels etc. directly into their report. These capabilities help developers make analytics and reporting accessible to non-technical users. Self-Service Analytics gives users the ability to easily build reports with the exact information that users need without tying up developer resources. This gives business users the ability to take control of their own analytics needs and helps them to extract maximum value from both their data and their application while simultaneously extending the overall agility of their organizational BI. Self-Service reaches beyond the static pre-defined data snapshots that traditional reporting software often provides allowing for an enhanced interactive end-user experience. Data is often the first step in the process of empowering your end users with self-service analytics and is at the core of self-service capabilities. In JReport, the act of organizing and structuring data is quite a flexible one. This is because JReport has a built-in metadata layer we call a “business view”. A business view allows you to create a flat semantic data layer, which can encompass data from multiple data sources and queries. In a business view, you can also format data to better fit an end user’s needs. For example, you can change a date format from Day/Month/Year to Month/Day/Year. You can also change the name of a field, for example, from created_data to date created. You can also create a hierarchy of data for use in drill-down analysis. For example, country->state->zip code->city. There are plenty of other features available in JReport including custom summaries and formulas to help build an easy to understand flat data structure that your end users can then use for self-service analytics. Self-service analytics has boomed in popularity in the last decade, but why is that? Traditional means of gathering actionable intelligence have always meant a substantial and time-consuming relationship between executives and IT staff. This is because when computer-driven analytics started to gaining popularity analytics and business intelligence software was very, very difficult to use. It took a specialized skill set found only in developers with analytics experience, statisticians, and data scientists to make even simple reports and dashboards for use in decision making. This meant that the utilization of BI in its early days was only done for executive-level decisions. The types of visualizations and ways of visualizing data being done then were also very limited meaning that decision making based on data the scope of who was using and how they could use data was extremely limiting. As requirements evolved, and the power of business intelligence started to be realized by executives, they started demanding quicker, easier ways to garner actionable insights from their data. This started a market trend of easier to use platforms, and more interactivity built within the reports, dashboards, and visualizations themselves. And as BI became easier to use, it also became more widespread in the persons using it. It wasn’t just executives looking for custom reports anymore, it was middle managers, and even end users. As the demand for reporting and analytics expanded, it became more and more difficult for IT groups to keep up with demand. So they started demanding more self-service capabilities. And this is where self-service analytics really took off, and where it has remained important today. 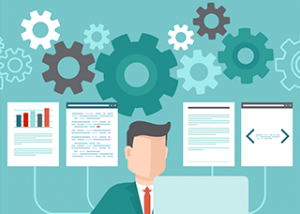 Self-service plays a critical role in many organizations that would otherwise have IT staff continually bogged down with ad hoc requests for analytical materials. But this is not the end of the story, as the rapid expansion in the amount of data has increased exponentially with the rise of more computing power and cheaper data storage; the ability to deliver self-service organization-wide has become more difficult. More data and more complex data structures have led to the rise of modern data warehousing solutions and even big data stores. But keeping up with what can be very different departmental requirements have become more and more difficult. And the solution for many businesses has been demanding embedded self-service analytics. By this, we mean that, instead of burdening an individual company’s IT staff with delivering different departments analytics based on each department’s individual applications, many are now pushing on the application developers themselves to deliver the analytical functions their users demand. And for IT, this means a much-needed reprieve in the number of applications they need to manage, and the type of data resources needed. Because instead of having to manage a set of application permissions and a set of data analytics permissions, they now only have to manage the former of the two to deliver both. JReport is a leader in self-service analytics for embedded use cases and helps fill the gap mentioned in the previous section. With JReport, application teams can deliver the much demanded self-service BI capabilities their users demand without having to sacrifice UI, UX, or branding. JReport is designed from the ground up to be embedded seamlessly into your applications. With an advanced set of APIs, you can match the look and feel of your application on the front end, and the business logic on the backend. As mentioned previously, JReport comes loaded with the ability to create a business view or metadata layer that enables end users to create, edit, manage, and share reports, dashboards, widgets, and other data visualizations. The empowerment this brings to users is compounded by the fact that it’s available in the application’s they already use, and the actionable insights they can gain from using these capabilities can then be actioned right their and then without having to switch application interfaces. Self-service takes work off of IT and support teams alike, by making it quicker and easier for users to access the data they need without reaching out to IT. Self-service often encompasses a wide variety of interactive feature sets that make data discovery quicker and easier. Embedded self-service analytics came about to make it more efficient for IT teams to manage data resources, while providing actionable insights to users in the applications they already use. JReport is a leader in self-service BI for embedded use cases and is built from the ground up to be embedded seamlessly into any application.